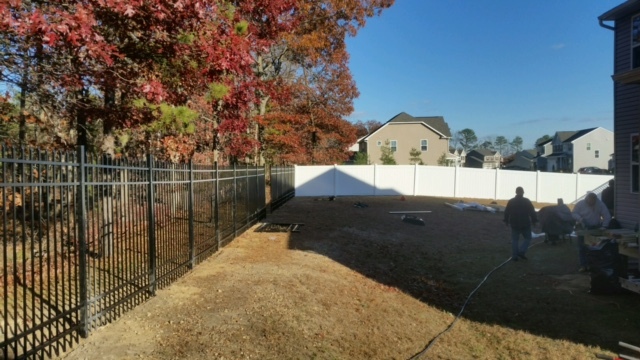 CLEVELAND, OH--(Marketwired - December 08, 2016) - Dennisville Fence, an ActiveYards® dealer based in Southern New Jersey, has donated ActiveYards fencing material for installation in the backyard of a home belonging to Joshlee Vadell, an Atlantic City, NJ police officer who was shot in September during a robbery in a casino parking garage. Friends, family and co-workers of Vadell volunteered to install the ActiveYards material over the past few weekends at Vadell's home. Close to 300 feet, over $8,000, was donated. Earle Collins, owner of Dennisville Fence, was contacted by a friend of Vadell, who explained the situation and wanted to know if Dennisville Fence was interested in helping to support the wounded officer. "The Vadell's had actually contacted us in August to inquire about a fence installation at their home. We offered them a proposal but at that time they decided not to move forward with the project," said Collins. It was after the shooting that Collins was contacted by a friend of Vadell. "It didn't take long for us to say yes. My brother Erik and I are very proud that we were able to participate in helping the Vadell family, along with their family, friends and fellow police officers. While it's not something we can do every day, it is awesome when we can," said Collins. Dennisville Fence is a family owned and operated organization, serving South Jersey's residential and commercial fence and railing needs since 1947. They currently have 3 South Jersey locations. Volunteers install a donated fence for wounded Atlantic City police officer, Joshlee Vadell, at his New Jersey home.